HEVC (H265) is widely used by Apple on its ecosystem including iOS 11, macOS High Sierra, watchOS and tvOS. As for playback HEVC video on your iPhone, you need to update to iOS 11 first. That's the basic requirement. And attention please, that doesn't mean you can play any HEVC video on your iOS 11 iPhone. Cuz Apple has requirements on your iPhone hardware configuration, as well. iPhone XS/XR/X, iPhone 8/Plus, iPhone 7/6s/Plus, iPhone SE, with Apple's A9 chip or newer support most HEVC videos playback, up to 4K 2160p. iPhone 6 and iPhone 6 Plus play HEVC video, up to 1080p at 240 fps. iPhone 5s maximum ability for HEVC video playback is 1080p at 60 fps or 720p at 240 fps. Hence, if you find your HEVC MP4 video unable to play normally on your iPhone, the video resolution and frame rate might be to blame, instead of just the video container format. After you find the reason, then you need the solution to fix it. MacX Video Converter Pro comes to rescue your HEVC video: convert MKV HEVC to MP4 HEVC, lower 4K to 1080p, change frame rate to 60fps or 240fps to best suit your iPhone requirements. Best HEVC video converter - MacX Video Converter Pro can help you convert MKV HEVC to MP4 HEVC, AVI HEVC to MP4 HEVC, upscale 1080p to 4K or lower 4K to 1080p full HD and change frame rate to 60fps or 240fps for successful playback on your iOS 11 iPhone 5s/6/Plus, iPhone 6s/7/8/Plus or iPhone X. 1. Intel QSV hardware accelerated speed to convert HEVC video from MKV/AVI to MP4, MOV, M4V, iPhone (iPhone X incl. ), iPad with 410+ profiles. 2. Lower HEVC video 4K 2160p to 1080p for playback on iPhone 6/Plus and iPhone 5s. Or upscale 1080p to 4K for playback on iPhone X/8/7/6s/Plus. 3. Freely change HEVC video frame rate to 60fps, 240fps, 30fps, as well as adjust video bit rate, aspect ratio, audio codec, audio channel, etc. 4. Free download HEVC movies videos from YouTube, moviefone, bliptv, 300mbfree4u, etc. 300+ safe legal websites with 100-300 MB in size. 5. Further edit HEVC video, including cut off unwanted parts from video, crop black borders off video, add subtitles to HEVC, rotate H265 video, etc. Load HEVC files via "Add Video" button or just drag and drop H265 files to this top HEVC video converter. Batch conversion is supported. 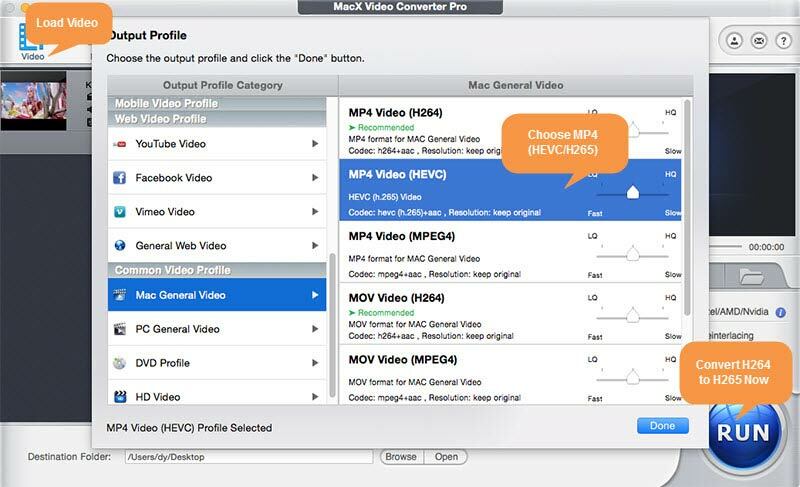 Select "MP4 Video (HEVC)" from "Mac General Video" profile. Of course, you can also choose "4K MP4 (HEVC)" as output format if you're using iPhone 7/8/Plus or iPhone X. 1. Frame Rate: the default setting of frame rate is "keep original". If you need to adjust frame rate, click the extension icon and then change frame rate from 30fps to 60fps or lower frame rate from 240fps to 60fps, 59.94fps, 30fps, 29.97fps at your disposal. 2. Resolution: your iPhone with A9 chip or higher can accept HEVC video up to 4K 2160p. So you don't have the need to lower resolution. If you use iPhone 6, iPhone 6 Plus or iPhone 5s, you need to reduce HEVC video resolution from 4K to 1080p. Press "RUN" button and this H265 video converter will begin to convert HEVC video from MKV or AVI to MP4 on computer. After the conversion is over, you can eventually play HEVC MP4 video on your iOS 11 iPhone for smooth playback. Optional: Click "Edit" icon to enter the video editing window, where you can enable "Trimming" feature to clear the unnecessary clips off video, free set the Start Time/End Time and use "Crop" feature to shrink the video image size with a marquee. Part 2 - Can't Play Downloaded HEVC Movies/Recordings on iPhone? Fix Here! Many a user is apt to free download HEVC movies on iPhone 8/7/6s and directly play HEVC on iPhone with the greatest convenience possible. Yet, the majority of HEVC movie resources originate from DVDRip, HD camcorder, web HDRip or BrRip. So the HEVC movie files come with different movie quality, resolution, bit rate, frame rate, etc., which, to great extent, make it tricky to smooth play HEVC movies on iPhone. On top of downloaded HEVC movies, some HEVC video recorded by your iPhone camera might also encounter playback issue if you record HEVC video with some improper operations. When the problem of HEVC not playing on iPhone appears, the effective solution you can try is to switch to another HEVC video player. CnX Player and H265 are the top two choices for your reference. 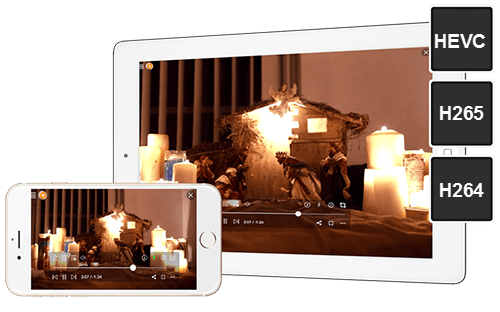 Overview: CnX Player is a HD video player application for iPhone iPad iPod, which allows you to play almost any video file, irrespective of standard video file MP4, MOV, AVI, FLV, or HD file MKV, TS, MTS, etc. In short, it can handle whatever you feed to it. 1. Play HEVC H265 video on iPhone, as well as 4K and HD video of H264, AVC and VP9. 2. Play MKV, MP4, 3GP, MOV, AVI, TS, FLV and other standard video formats. 3. Support audio playback of AAC, MP3, MP2, MP1 and OGG Vorbis. 4. Let you rename, delete, move and copy HEVC files with video management features. 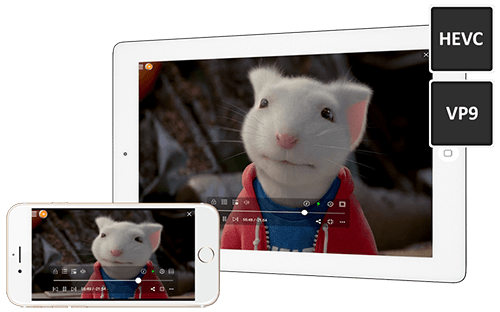 Overview: As its name suggests, H265 is a High Efficiency Video Coding player app designed for you to play HEVC/H.265 video files and network streams in the MKV format on iPhone iPad iPod. In addition, this HEVC video player also enables you to stream HEVC video files from the network and watch HEVC content offline. H265 compared with H264, it will help you save up to 50% network bandwidth for HEVC movie streaming. 1. Play HEVC H265 movie on iPhone iPad after downloading HEVC mobile movie. 2. Other video format playback also supported, like MP4, MOV, M4V, AVI, etc. 3. Play Video Stream feature allows users to stream video from network or add video via iTunes file sharing and watch them on iPhone offline. Have a try the aforementioned solutions if you can't play HEVC on iPhone 8/Plus/7/6s/SE/6/5s. If they don't work, converting HEVC H265 to H264 is the ultimate solution. Admit it or not, H264 has been existing for a long time and most devices, platforms and players are compatible well with H264. Comparatively, HEVC is much younger and still has a long way to go. So when you fail to play HEVC video on iPhone 8/Plus/7 iOS 11 device, don't feel frustrated. After all, it has just started. When it becomes more mature, you will find what you are struggling today will be easily resolved. iUse MacX HEVC Video Converter to convert HEVC from MKV/AVI to MP4 iPhone supported format. And use its built-in parameter adjustment feature to lower 4K to 1080p, adjust video frame rate to 60fps or 240fps, etc. Thus, you can play HEVC on iPhone 8/7/Plus/6s/SE/6/Plus/5s without trouble.